We are the leading manufacturer and supplier of Coffee Roaster. 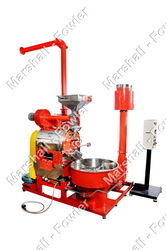 - Coffee roasters are suitable for roasting coffee batch by batch. Machine is supplied with motor. Pcr 10 is having a cooling tray with a hand operated stirrer. Pcr 15, 20, 50 are having motorised stirrers for cooling tray. - Machine is supplied with motor. 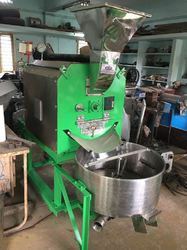 For pcr 50 a bucket elevator is provided with 1/4 hp motor for feeding the coffee to the hopper. Finally after the complete process of obtaining the coffee bean we offer Roaster and grinders from renowned manufacturer of ITALY roasting machine and Grinders. Machine with a capacity of 60 kg. for batch, for to roast automatically the coffee enrobed with sugar.